It’s time to start planning our New Year’s resolutions. I know the tradition of the “New Year’s resolution” is one that is best known for its failures — three weeks of going to the gym, eight days of drinking enough water, one time taking the train at night when you wanted to take a cab and actually you should feel proud about that time because you were tired — but this year, as the world crumbles around us, I’d like to challenge you to do better. I’d like to challenge you to stick to your resolution for the entirety of the year 2018. I think you can do it. My New Year’s resolution will be, of course: live, laugh, love. But yours will be, if I might so bold as to demand, which I might be, and I am: no more upside-down smiley in 2018. Petulance; enmity; toxic disapproval that is un-charming to behold; impatience tinged with inhumane rudeness; vile hatred. I do not think I am being over the top in saying that the upside-down smiley represents not all but many of humanity’s worst aspects and that it should be abolished or at least I would like to no longer see it anymore personally. The upside-down smiley has no place in this world going forward. I would never attempt to tell you what to do, as you know, but I would like to let you know that I think you are stronger than the upside-down smiley. You are better. Do not give into this terrible desire. 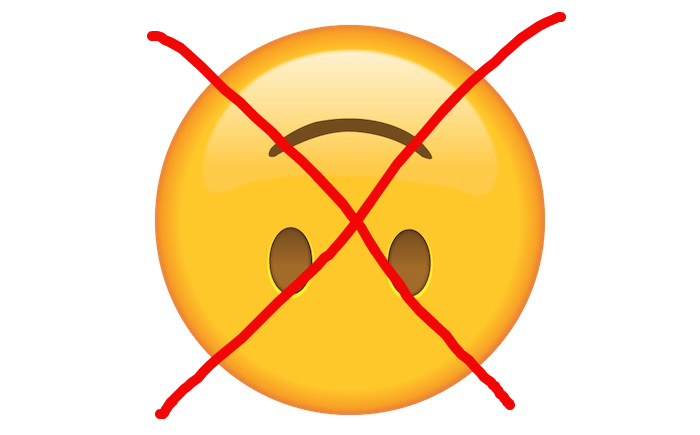 If you must express your disapproval via emoji, please — use a regular smiley. “I see Jessica is going to the party. [smiley]” If your friend knows you dislike Jessica, she will understand that you are unhappy that she is going to the party. “Just checking if you saw my email? [smiley]” The recipient of your email is aware that you would like a response. The smiley suffices, and it takes the edge off even though I know you are a monster and you are desperate to show it no offense I am telling you this out of love. It would be better to not make communication more unpleasant than it has to be. Q: But I am normal and I just like to use it. Can I? Q: I don’t understand why it’s bad. A: That is in part due to the fact that this is not my most successful persuasive writing attempt, but it mostly proves you are one of the people who needs to stop using it the most.